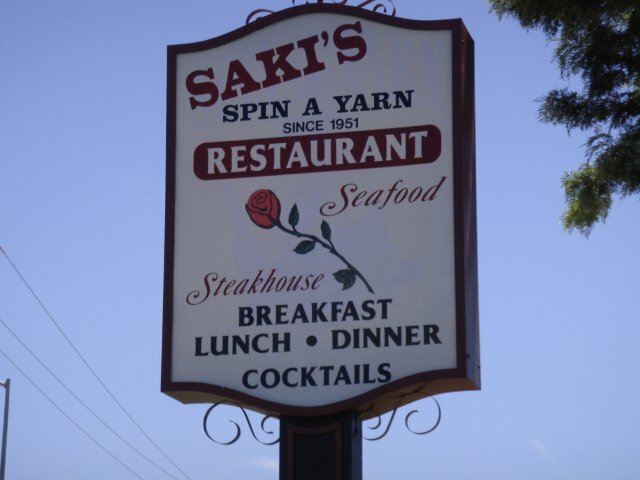 In this Kitchen Nightmares episode, Chef Gordon Ramsay visits Spin a Yarn Steakhouse in Fremont, California, Saki bought the restaurant in 1995, hired Jen as a waitress, they got into a relationship before later marrying and having a child. When the business slowed down Jen persuaded Saki to remodel the restaurant and overspent by $600,000. The couples daughter reveals that they are on the verge of divorce. Gordon meets Jen at home, she is nervous that she is seen to be a trophy wife. Gordon arrives at the restaurant and is impressed by the $80,000 bathroom. Gordon orders the Greek Sampler, crab Louie and a filet mignon. He is not impressed by the food and meets head chef Victor, he tells him that his food is disgusting. At dinner service he sees Victor washing dishes rather than cooking, food is sent back and Gordon finds old meat and rotten vegetables. Gordon sits the couple down the next day to discuss the lack of communication and Saki promises to change. For the next service, Saki is expediting in the kitchen and Jen is front of house, carving prime rib at the table. Jen is nervous about this but with practise she gets the hang of it. Gordon decides to give them a single cuisine to focus on and transforms the restaurant into Spin A Yarn Steakhouse and the menu is slimmed down. On relaunch night Gordon announces that the San Jose Sharks will be eating in the restaurant that evening. The relaunch gets off to a good start with the Prime Rib being a big hit, however Jen is cutting it too thick and they are running low. Overall, the relaunch is a success and Gordon praises the couple on their teamwork. The prime rib remains popular, is drawing in customers and they are working together a lot better. Spin A Yarn Steakhouse is open and in May 2012, a new head chef was appointed. Yelp reviews are mixed but mostly positive. Planning on visiting the restaurant? See the website for opening hours and more info. Spin A Yarn Steakhouse was aired on February 10 2012, the episode was filmed in October 2011 and is Kitchen Nightmares season 5 episode 11. This ep made me cringe. That poor fool probably wasn't smart enough to get a pre-nup! This blog is such a GREAT idea! Love the links that follow each post as well! In some ways I felt bad for the guy because he was oblivious to it. Sad case in a state were women divorcees receives an uneven share. Worse thing is, is that her daughter acts like her already and she's only 14. Reminds me of the movie "Casino". Totally agree. Watching this woman with her drama angered me. She acted like it was HER restaurant. The daughter stating the restaurant was just as much hers as his, was awful! The daughter was more mature than either one of the parents. : ? Sorry but when a man is only interested in younger women for their looks and naivete he kinda gets what he deserves, just sayin'. Ah so a man can only be interested in women his age? He should be ashamed for liking attractive women? She's not naive, she's a golddigger. Exactly. They both got what they wanted, then decided they deserved more. Uhm, I agree he got the kind of woman he deserved. All these "gold digger" comments don't consider that she is definitely a trophy for him. That's what happens when you put appearances before strength and character, which a lot of men do and then whine about how some "attractive woman" they feel entitled to ended up exacting payment from them. This is one episode I could not watch all the way through. It made me cringe too much when the wife opened her mouth and said "I'm not a gold digger or a trophy wife". I'm sorry but when someone starts talking like that it is hard for me to believe them. I can't believe the things people are saying about the daughter. Spoiled? No. A spoiled child wouldn't be so enthusiastically contributing to the family business. I thought she was incredibly mature and professional for her age. If they continue to do well I could easily see her taking over one day. the woman was an embarassment, i couldnt tell if she was a complete idiot or conniving. i wish i could find a man who loved me as much as he loved her. edit: just watched the my restaurant/your restaurant quoted part. the girl is a brat. she has a point, but she is bratty and shows no respect for her stepfather and is incredibly rude and immature. its disgusting the way she talks to him. not out of love, but distain. the daughter is very mature for her age. She is the only adult at the place. She sees the others (not incorrectly) as fools so she doesn't have much respect for them. Respect has to be earned and they didn't earn it. She was more mature than any of the adults there. The mother and daughter are both totally happening. That being said, as soon as Saki gets solvent again, they'll take him to the cleaners. That's what happens when one tries to live out an old man's fantasy. No doubt he lied to her about how rich and successful he was. Then allowed her to order all that expensive bourgeois crap for his restaurant. I guess he underestimated her "taste." Now she gets all the blame for his financial failures. She's a pitiful woman, really. I wouldn't classify her a "gold digger" but she definitely a princess-type who expects a man to provide for everything. Lots of men are dying to do that for somebody younger and prettier than them and this guy is an example for sure. He was a fool. Lazy and gluttonous and kind of shady too. Notice he had to think for awhile about where to say what part of Greece he's from? WTF is he hiding from, lol! At no point did I see the daughter or mother working at all during this entire episode.... The daughter definitely was not respectful, the mother would dodge out of the kitchen. I don't buy the act. Im pretty sure they got divorced because was always making excuses and was not acting like a man. Just watch the episode. How he ran the restaurant was how he lived his life. She did say something about a baby at the very beginning (like 2 minutes into the episode). Yes, and there was a pictures of the baby girl, one with Jen, hanging in the office Gordan talked to Makayla in. I just watched the episode on Hulu. As a mother to a 17yr old boy, a 16yr old girl and 2 15yr old step-daughters (who live with us) the comment Makayla made wasn't shocking coming from a teenage girl. Furthermore, I wish my children were so willing to work instead of being focused on socializing. what Makayla said was wrong, she got kicked out of the kitchen and made that remark to a man who feeds, pays her check for her and her mom. She knew her stepfather wasn't going to respond to that or else the mother would've got involved. She is not referi she is adding more to the pot. She is a teenager and hasn't been taught not to talk to her stepfather that way not really her fault but her moms. I don't feel bad for Saki, he married her she is allow to spend his money so is his fault he let her take advantage of him, I'm sure he got what he wanted from her too. I cannot believe what I just saw. His wife just hid behind a curtain!!??! A ruddy curtain, just as Saki came through the door from the kitchen! OMG, you have got to be kidding! I think it is neat that they are still in business. I have been binge watching Kitchen Nightmare on Hulu. I check to see if they are open or closed. "I can't believe white Oprah is sitting in my living room." What? She has to be a gold-digger because she is too dumb to do anything else. She became attracted to him only after expensive trips and gifts were handed to her. She didn't see a person she wasn't attracted to. She saw dollar signs. So what? He married her for her looks and to show her off. Who's worse? Love is about finding someone you're most attracted to for whatever reason and then committing to them, she comes across worse.